Angela swears she is a boy (not a girl) and makes us call her handsome and NOT pretty. She loves having short hair and doesn't let me brush the little hair she has. 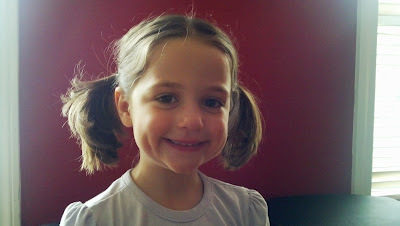 I had an appointment to get her hair cut this afternoon because if she isn't going to brush it she needs it short so it still looks OK. Wouldn't you know this morning Angela asks for piggie tails! This one keeps me on my toes! Since Memorial Day was rainy until Monday, we immediately went out to the Esplanade to ride bikes when the sun came out. The river is one of the best places in the city and there are so many playgrounds we could spent every day there. 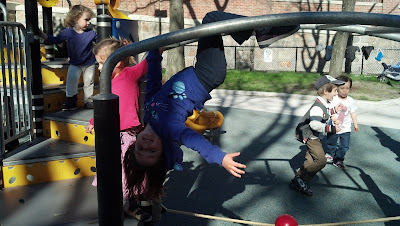 Angela is such a monkey and spends hours conquering all monkey bars. She can do almost all of them now. Finished with a BBQ on the roof and some ice cream. Summer is here!! 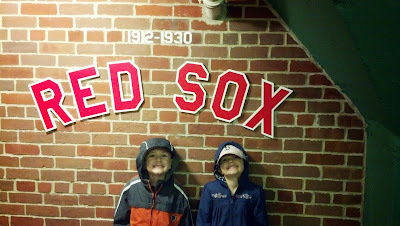 Nothing better than a Saturday afternoon Red Sox game. Well minus the rain it was a perfect one. 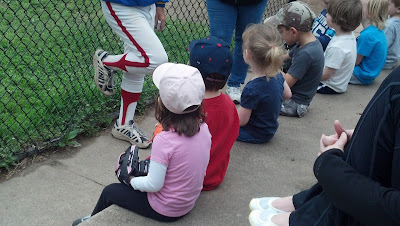 The kids could care less and cheered as usual with their good buddy Colton. Even after a huge BBQ lunch, Colton and Angela split a hot dog and hot chocolate. 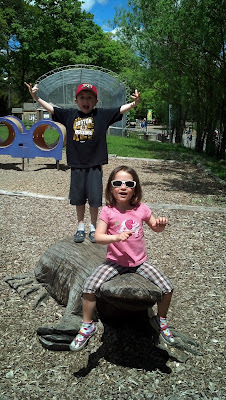 I let Rich stay home from school today and we went to the zoo. Sometimes you just need to skip a day and play! I can't even remember what number trophy this is. BUT Richard loves each and every one of them like they were his first. I actually do remember last soccer season fondly. The kids actually went after the ball this year instead of picking weeds the whole time. They attacked the ball in such a tight clump that when one tripped the whole pack would fall to the ground like dominoes! 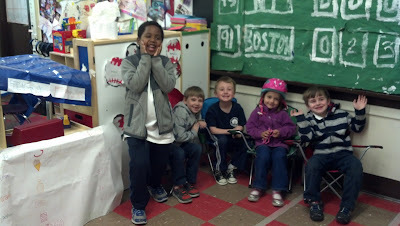 Richard's class spent the past couple of weeks bringing Fenway Park to their classroom during choice time. As you can imagine Rich has been the leader of this task. I wish I got better pictures because there is the green monster and a Fenway Franks stand (that you can't see all that well). 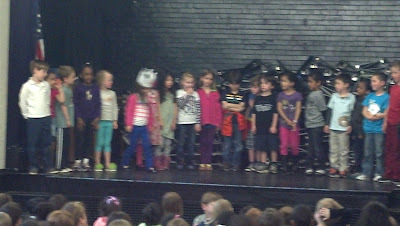 The kids learned about using a cash register and how to talk to customers. 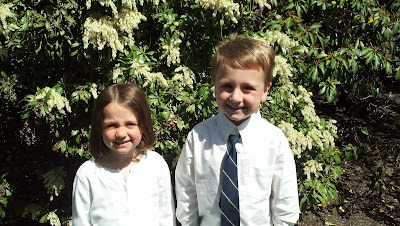 The kids also had an opening day party, but unfortunately Richard missed it because he was out with his horrible allergies this season. 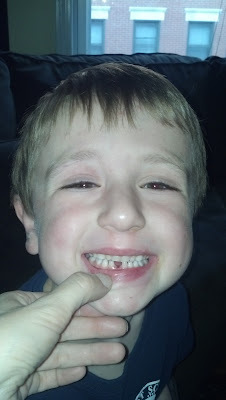 Guess who finally lost a tooth! Richard had been so worried that he wasn't losing teeth like his friends at school. And when his dentist said it could be as late as age 8, he was beside himself. Well luckily one loosened up with enough twisting at school. At dinner we talked about how it could be a couple of days before it fell out and I was starting to get worried about him not eating and loosening this tooth until it was hanging. Well we didn't have to worry about any of that because before the dishes were done, he had yanked it out! The tooth fairy sent him a nice note and gave him $5. I got to spend another wonderful Mother's Day celebrating with my Mom and my lovely family. We now have a tradition (that I hope we keep!) of going to church, to a park then to PF Chang's for Mai Tai's! 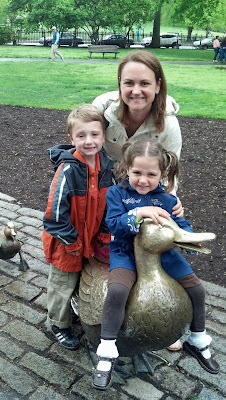 This year we also went to the Common to see the Ducklings from the book Make Way for Ducklings. It is a Mother's Day tradition in Boston. AND after our Mai Tai's the girls hit the salon for mani/pedi's. A great day with my ducklings! After 3 years of sitting on the side lines watching her brother, Angela FINALLY gets to play a sport herself. She was OVER the moon excited and said at 8 am that she wished it was already time to play. She loved it and I can tell she is going to be good. Her brother makes her practice enough! 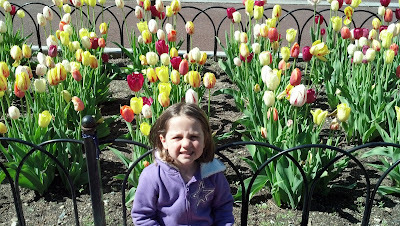 Just a beautiful spring Friday with my baby girl. Can you believe she wore a skirt?!?! Chris and I were grinning from ear to ear as we had the honor of becoming Bradley's Godparents. It was a wonderful ceremony and a GORGEOUS day. This beautiful child is a lucky one! There was a lot of love between the Michael and Wells families. 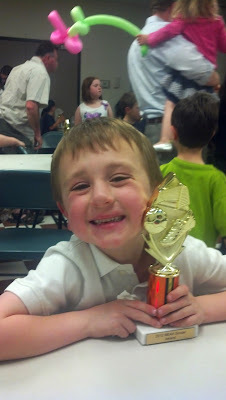 All this kid thinks about is SPORTS!! No matter what it is or where he is Richard will find something to throw, kick or shoot. 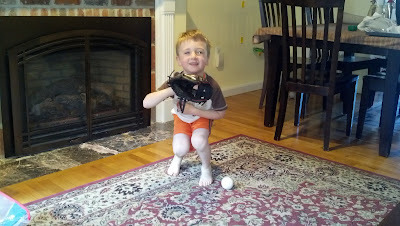 Since it is baseball season, he is obsessed with baseball. We have had a catch in the living room every day starting at around 6:30 am (or as soon as he gets up). He is a morning person so he is ready for baseball as soon as his eyes open. And I agree to have a catch with him because I can do it while sipping my coffee on the couch! Not sure why/how I agreed to baseball in the house since we do only have 3 wine glasses left, but that is a whole other story! It does get frustrating when he is reads his baseball schedule a hundred times a day instead of eating breakfast. Does he think it changed in the last 5 minutes?? Does it get any cuter! Angela is so proud of everything she accomplishes and she practices until she masters what she set out for. The monkey bars were this weeks task. She spent at least 5 hours total today going up/down/around. 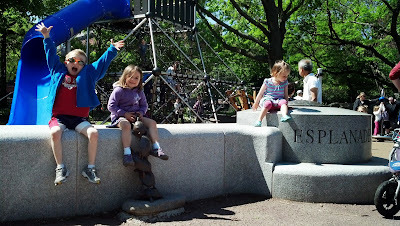 I love living in the city where there are parks on every corner for the kids to "practice" being kids! 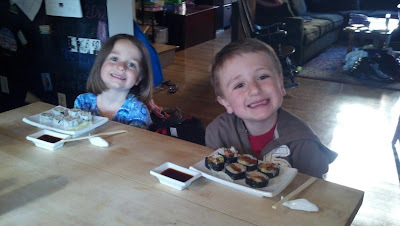 Glad this wedding present sushi set gets some use again! !